I am one of those people who really enjoys a good metaphor. Not a cheesy one that is taken too far, but one that seems to perfectly represent what I am going through. When I began dating this summer, I found one of those perfect metaphors that seemed to fit what I was going through. I realized that entering and being in a relationship is like canyoning. So canyoning is an activity that I did in Ecuador this summer. I hadn't known it was even a thing until I arrived in the town of Baños and knew immediately that I wanted to do it. 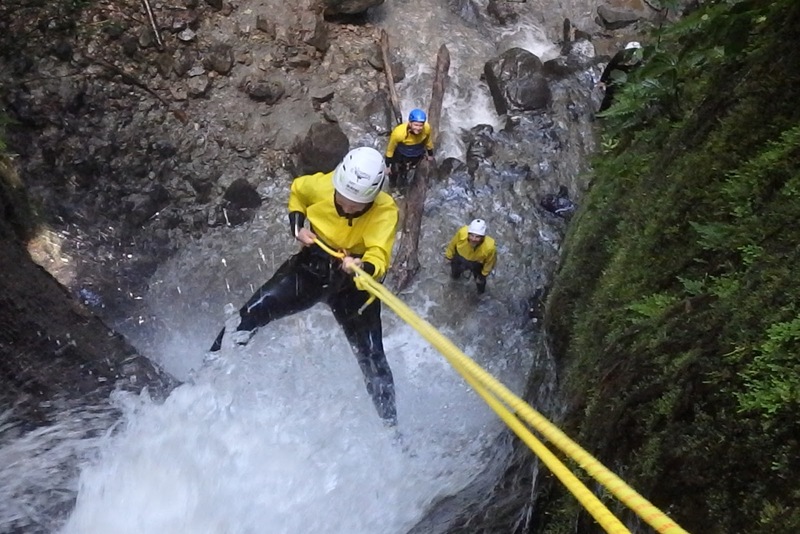 Simply, canyoning is where you repel down waterfalls. I went with my cousin Cara and were joined by two guys in addition to our guide. We drove to a nearby mountain and then hiked partway up in wetsuits. Our guide would then hook us onto rope and we would jump off the side of the waterfall and make our way down. In preparation for this, we got basic training in town. We first watched a video of how to do it and then we practiced repelling on a wall outside. I compare this to all the time I was single. I have spent years watching my friends be in relationships. I have seen their mistakes and their different techniques. And in doing so, I did learn a lot. Going into a relationship, I felt that I knew a little of how it is done from watching others. And in canyoning, I got to practice. I learned how to stay perpendicular to the wall and to keep my feet flat. I felt good and was ready to conquer this new challenge. Until I got to the top of the waterfall. To begin repelling down the waterfall, you first have to take the first step backward off the cliff and trust that the rope is going to hold you and that your guide won't let you fall. This first step is absolutely terrifying. Even though I was excited about the activity, it took courage to make my way down. This was the same with dating. I have felt prepared to enter a relationship for a while, but the being vulnerable actually telling someone you like them is terrifying. It takes so much courage and vulnerability. I always imagined, though, that after that first step it would be fine. I practiced this and had learned from others, right? I knew to stay perpendicular and to keep my feet flat against the rocks. But what they didn't say is that the rocks aren't flat. Rocks are jagged and it is really hard to keep the correct position. Especially because you are in the middle of a waterfall and cannot even see the rocks or even your feet! You are trying desperately to keep your form, but at the same time you are freaking out because there is just so much water. This is nothing like the video or practice! And this is how I felt in my relationship. I thought I knew how to be a good girlfriend and the steps I should take. I thought that a romantic relationship would be similar to other relationships. I knew it would not be easy, but once I was in the midst of the relationship I realized there were so many things that I didn't know. I realized that there is no set path and you just have to go, trying your best to not be overwhelmed by the rush of new feelings and experiences. Just as the rocks were not flat and every waterfall is different, each relationship has to be managed in a new way and often this cannot be determined beforehand because there is no way to see how it will be. It turned out that I was not great at canyoning. There were a couple of times that I lost control and ended up hanging by the rope in the middle of the waterfall. However, my guide was able to hold me and lower me to safety. And I wasn't the only one. Even the really athletic, super-good-at-everything guy in my group fell during a couple of points. It is the same in relationships: no one is perfect in relationships. We all make mistakes and all have to realize that there is still so much to learn. But if we are lucky, we will have a good support system of not just our partner, but of friends and family who will support us when we lose control. Canyoning turned out to be totally worth the struggle. Even though there were some terrifying moments when the water seemed to be overtaking me, I had a blast. After the last waterfall, I felt like I triumphant. I conquered my fears and even though I was not perfect, I did this crazy thing. I made it to the bottom and was even able to have a lot of fun, despite everything. The relationship I mentioned back in November is now over. Looking back, I am able to see how much I learned. He and I were not the best fit and the rocks were not always smooth. I made mistakes, as did he. However, I have no regrets. I learned so much about myself and also what I want in a relationship. I will take all this learning to the next relationship I am in and I will be better because of it. I now know a little more of what to expect, although I also understand that like canyoning, all relationships are different and there is no one way to get through. I am sure that it will still be equally terrifying taking that first step backwards off the cliff, but I know now just how rewarding it can be. And so I look forward to the next time I go canyoning, even as for right now, I am so happy to be on dry, flat ground. This is me canyoning in Baños, Ecuador this summer. I believe this is the waterfall that I fell in. However, it was still so much fun and I look forward to someday doing it again.